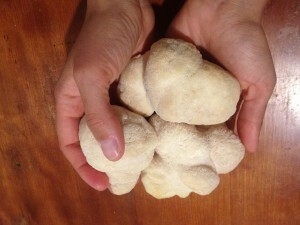 How crazy are these Lion’s Mane mushrooms? Ever since I spotted them last week at Far West Fungi, I’ve been curious about them. I grew more intrigued as I learned that when cooked, they have a texture similar to crab meat (! ), and that many people eat them to help regenerate their nerve endings. 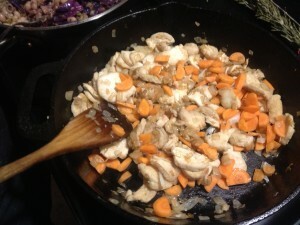 With all of this wild trivia swirling through my head, I was excited to try a recipe that used only a couple of ingredients, and that would allow the unique flavor of these mushrooms to come through… you’ll just need some butter, carrots, onions, parsley, and of course, Lion’s Mane mushrooms! 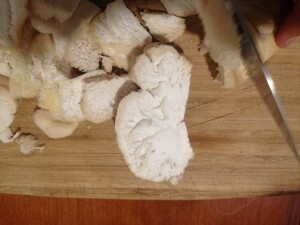 Once you cut the mushrooms open, the resemblance to a lion’s mane becomes even more apparent. Slice the mushrooms into pieces about 1/4 inch thick. 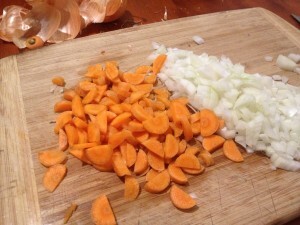 Next, dice a small white onion and then halve and thinly slice three carrots. 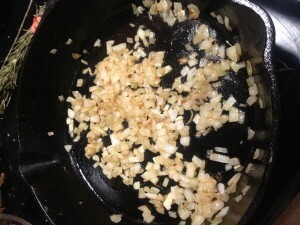 Brown 1-2 tablespoons of butter in a pan and add the onions. After about 10 minutes, add the mushrooms to the onions. They will soon start releasing moisture, adding their fabulous flavor to your dish. Add a pinch of salt and/or pepper, if that’s what you feel, and continue to sautee! 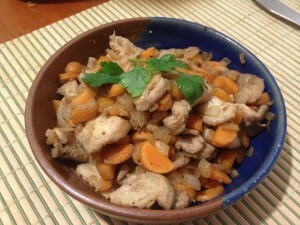 Stir in the carrots and cook for about 5 – 7 minutes more. Remove from the stove and serve with a dash of flat-leaf parsley. Lion’s Mane mushrooms are indeed, absolutely delicious… to me, their taste and fabulous texture was more like scallops than crab meat as had been suggested. My two friends and I enjoyed them as the centerpiece to our meal and we are excited to have a new mushroom in our repertoire! Thanks so much! If you’re ever in San Francisco please come visit us!